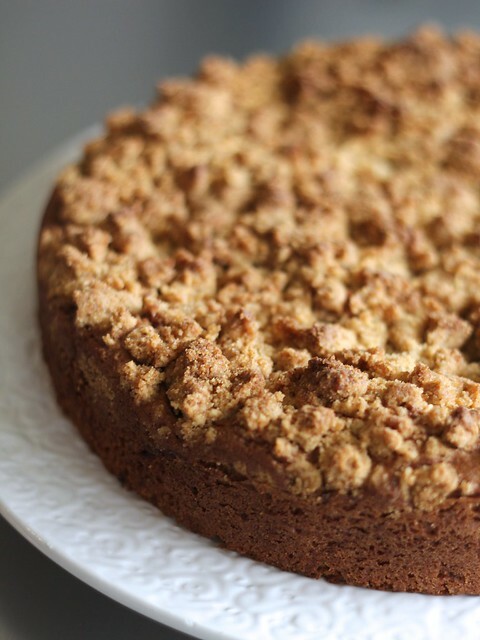 Have you been searching for a new crumb cake recipe to add to your rotation? Look no further, this raspberry-studded rendition has it going on — each bite bursts with jammy fruit flavor! But want to know my favorite part? 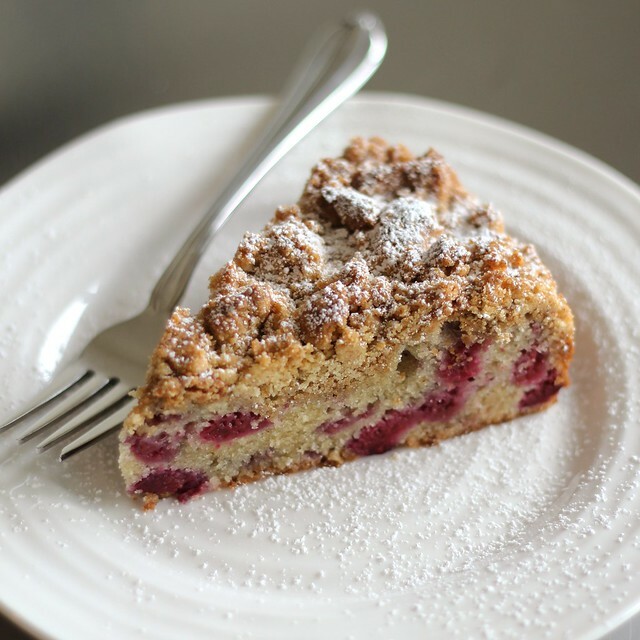 I love how the textures play off of one another — perfectly tender cake, pops of raspberry and a crisp crumb topping all on the same fork. It’s a beautiful thing. Unlike the classic crumb cake which is loaded with cinnamon, you won’t find even a pinch of the spice here. Instead, the cake is thoughtfully flavored with a dash of vanilla extract and a few handfuls of frozen berries. The latter miraculously melt into little flavor pockets in the oven, without making the cake soggy. As for the topping, almond meal and just a touch of vanilla bean “caviar” add a delicate, delightful touch. Can’t you just taste it already? 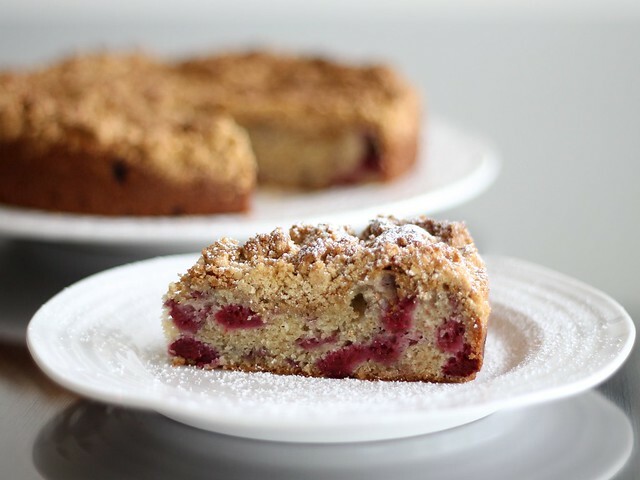 Are you team classic, big crumb cinnamon coffee cake or do you appreciate an alternative flavor combo more — say, one incorporating fruit or chocolate? Let’s talk in the comments or on Facebook or Twitter! Position rack in the center of the oven and preheat to 375°F. Butter sides of a 9″ round cake pan and line bottom with a sheet of parchment paper; set aside. Whisk together millet flour through baking powder in a small bowl. In the bowl of a stand mixer fitted with the paddle attachment, beat softened butter at medium speed (#4 on a KitchenAid) until smooth, about 1 minute. Scrape down the bowl and beater. Add sugar and beat (on medium speed) until well combined and fluffy, about 3 minutes, scraping down the bowl half way through. Add egg, beat on medium until well blended, about 1 minute. Add sour cream and vanilla extract and beat just until blended, about 15 seconds. Scrape down bowl, turn the mixer on low and add flour mixture; stir just until incorporated, about 30 seconds. Gently fold frozen berries into batter — the cake will get a few streaks of color, but it won’t really be evident after baking, so no worries! Transfer cake batter to prepared baking dish, spread into an even layer — an offset spatula is really helpful here. In a medium bowl, whisk together millet flour through brown sugar; set aside. Combine still-warm melted butter and vanilla bean seeds. Stir butter mixture into flour mixture until well blended. Squeeze small handfuls of topping together to form clumps, sprinkle evenly — breaking clumps up as necessary — over cake batter. Press crumbs down lightly to help them adhere. Bake cake in preheated 375° oven for 30 minutes, then reduce oven temp to 350° and bake for 20 – 30 minutes more or until tester inserted into center comes out clean. Place pan on cooling rack, and allow cake to cool for about 1 hour before running a thin knife or spatula around the edges to loosen. Invert cake onto another cooling rack, peel off parchment, and invert once more so it’s crumb side up (you’ll lose a few loose crumbs in the process, but no biggie). Cool completely before slicing! Once cooled, cut wedges of cake and sprinkle with powdered sugar (if desired) just before serving. Cake will keep well at room temperature for a few days covered with plastic wrap, or you may freeze individually wrapped pieces for several months, remove from freezer several hours (or the night before) before serving. ¹ If desired, the vanilla bean pods scraped of its seeds can be used to make vanilla-scented sugar — it couldn’t be easier!